Phone Iwatsu - Advance Communications & Consulting, Inc. The Iwatsu Enterprise-CS SBE is a full featured IP phone system with the Esnatech Officelinx SBE unified communications system. Optimized for small business, Iwatsu Enterprise-CS SBE will grow to accommodate up to 1024 users. 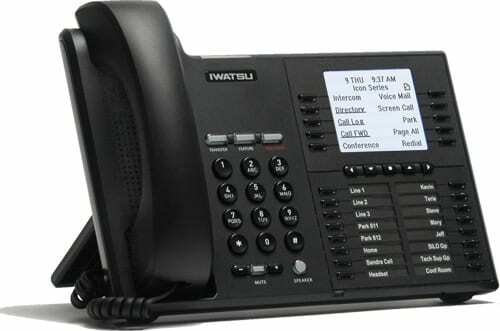 This Iwatsu Enterprise-CS Small Business Edition (SBE) phone system includes a full-featured IP-PBX with unified communications. Consisting of an Iwatsu Enterprise-CS platform fully equipped for VoIP and the Esnatech Officelinx SBE unified communications system, the Iwatsu Enterprise-CS SBE delivers reliable IP voice processing, full featured automated attendant and feature rich unified communications in a highly affordable package. We are a Factory Authorized Dealer and Employ Iwatsu Certified Technicians.